Denim may fade over time, but its popularity never does. 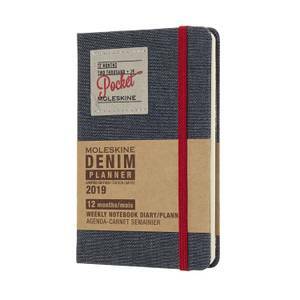 The tactile Denim Collection 12-Month Pocket Weekly Notebook Diary/Planner is formatted to show the week’s appointments on the left with a full lined page for notes, to-do lists and ideas on the right. It is a handy and versatile diary/planner that allows you to see the whole week in one place, while also incorporating the freedom of a notebook. A striking red elastic closure secures the pages while a matching bookmark ribbon helps you stay on track throughout the year.